The cast list for Spiderman the movie contains a ton of "A-List" stars. Sam Raimi directed all three Spiderman films and Stan Lee, the original comic book writer, took the helm as executive producer. 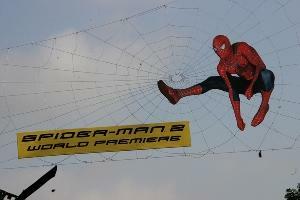 Spiderman went on to win two Oscar awards for "Best Sound" and "Best Visual Effects". Along with the cinematic skills of the director and special effects staff, the cast for Spiderman had great chemistry together, making the films that much more enjoyable for Spiderman fans. The cast list for the Spiderman trilogy hasn't changed a whole lot since its first installment. The head of the impressive list is Tobey Maguire. At the age of 10, Kirsten Dunst received high critical praise for her work in the film Interview with the Vampire. Reviews for the film were mixed, but Dunst's performance was praised across the board. Dunst went on to star in a number of films before she decided to audition for the role of Mary Jane Watson. Dunst reportedly wasn't interested in the film until she heard that Tobey Maguire was playing the lead role. On auditioning for the role, Dunst said she decided to do it because she believed the film would have more of an independent film feel rather than a huge action blockbuster. Though Dunst has received much praise for her work in other projects, Spiderman is, so far, her biggest box office success. Before landing the role of Harry Osborne, Peter Parker's best friend (and later, nemesis), James Franco was probably best known for his role as the much loved, but sadly canceled, show Freaks and Geeks. When auditioning for the film, Franco had originally read for the role of Peter Parker. Franco has gone on to play the prominent role of Scott Smith in the Oscar award winning film Milk. Many of Franco's fans were surprised when he decided to do a short stint on the soap opera General Hospital, playing the villainous role of Franco. When asked about the seemingly strange career choice, James said that he thought doing a soap would be "…amazing. At the time, he was working on the film Maladies'' in which he plays a former soap opera star. All three Spiderman films have been enormous box office successes, though there is no word that Sam Raimi and company plan on continuing the sequels. To date, the original Spiderman had a budget of around $140 million film and ultimately ended up earning $822 million worldwide.